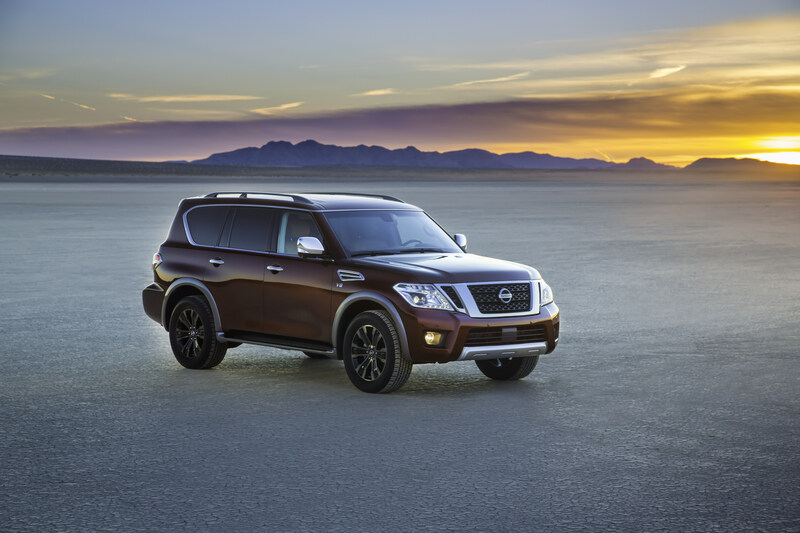 For 2017, Nissan has replaced the original, first-generation Armada full-size SUV with a version of the company's global Patrol model. A slow-selling model, the previous Armada was based on the prior-generation Titan pickup truck platform. This new Armada now shares its platform, powertrain, exterior styling, and interior with both the Patrol and the Infiniti QX80. The result is a more modern and sophisticated vehicle, even if the design and engineering are not new. For this review, our expert evaluated a 2017 Armada Platinum with 4-wheel drive (4WD) and the Captain's Chairs option package. The price came to $62,035, including the $1,095 destination charge. According to J.D. Power research, buyers of full-size SUVs most often identify themselves as practical buyers, at 27%, followed by performance buyers, at 19%. Overwhelmingly, they prefer to buy a full-size SUV from a domestic company, with 85% agreeing that this is true. Given that most full-size SUVs do not return good gas mileage, 60% disagree that their first consideration in choosing a vehicle is miles per gallon. Still, that leaves 40% of full-size SUV buyers seeking a vehicle that will maximize mileage within the segment and, surprisingly, 43% claim to agree that they will pay more for a vehicle that is environmentally friendly. J.D. Power data show that buyers of Large SUVs appear to be car enthusiasts, with 69% claiming that their friends and family think of them as someone who knows a great deal about autos, and 94% agree that they like a vehicle that offers responsive handling and acceleration. J.D. Power data also shows that 79% of full-size SUV buyers like a vehicle that stands out from the crowd, and 69% disagree that a vehicle is just a way of getting from place to place. Safety, reliability, quality, and low maintenance costs are important to full-size SUV buyers, with at least 85% of J.D. Power survey respondents agreeing with this assessment. Not surprisingly, 93% agree that they require a versatile vehicle that accommodates a busy lifestyle. 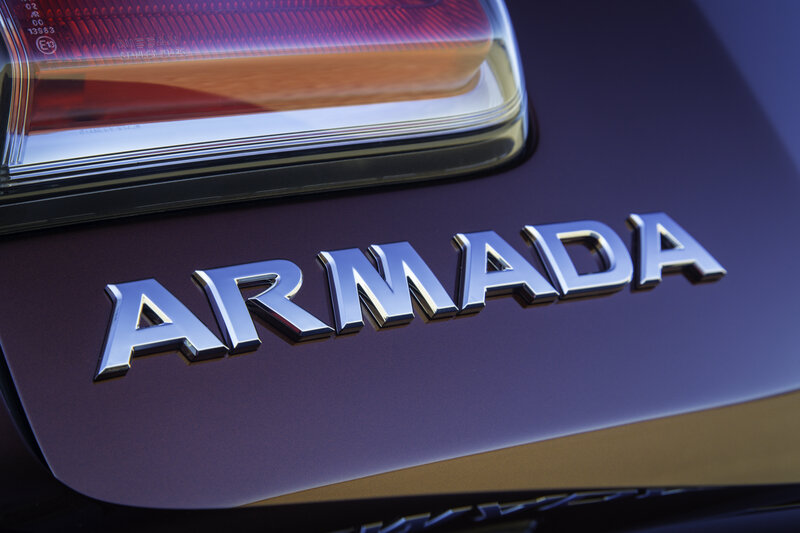 *Data specific to the previous-generation 2016 Armada is unavailable due to the vehicle's low sales figures. 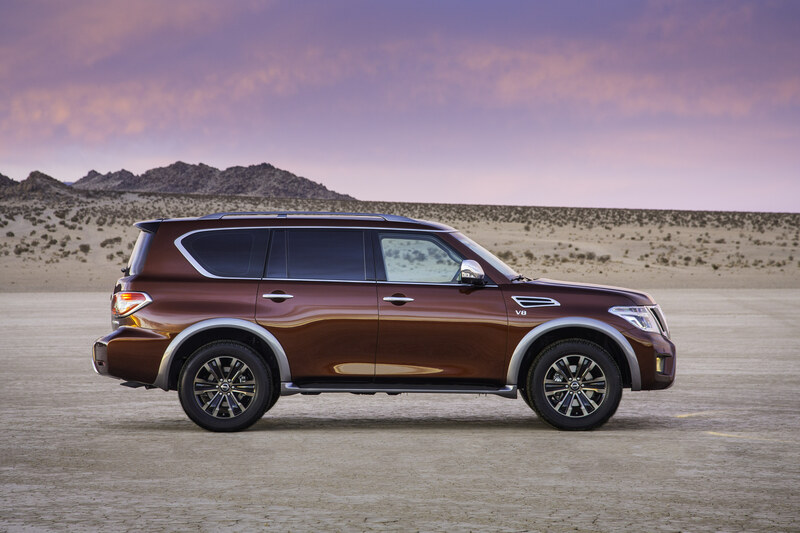 Especially when viewed in profile, it is easy to spot the similarities between the Infiniti QX80 and the new 2017 Nissan Armada. The Armada's styling is unique from the windshield forward, and the Nissan also has a different rear liftgate and rear bumpers. Wheel designs are also exclusive to the Armada. Given that so many full-size SUV owners like to drive a vehicle that stands out from the crowd, the Armada is a refreshing departure from boxy-looking competitors from Ford and General Motors. Beyond this benefit, it looks appropriately rugged, too. 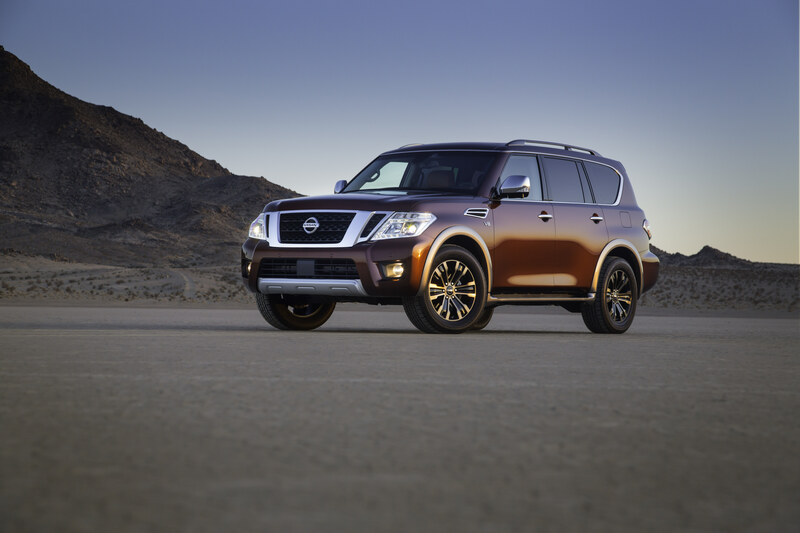 People familiar with the Infiniti QX80 will instantly recognize the Nissan Armada's cabin. There are differences, such as the absence of an analog clock, a lower grade of leather upholstery, orange nighttime control lighting, and other minor detail changes, but for the most part this Nissan provides the same design, layout, and materials as the Infiniti. Because the new Armada is based on an older SUV, the driver uses buttons and knobs rather than the touch-screen infotainment display to access common functions, right down to radio station pre-set selections. In a world where this old-school approach is increasingly rare, the Armada's instant familiarity and ease of use is refreshing. The Nissan Armada is fitted with seat belts for 8 people, but that does not mean they will all be comfortable. At best, 5 adults and up to a trio of children will be happy. Up front, the Armada Platinum is equipped with leather-wrapped, heated, and ventilated seats that are flat, firm, wide, and supportive, capable of delivering comfort for long stints at the wheel. 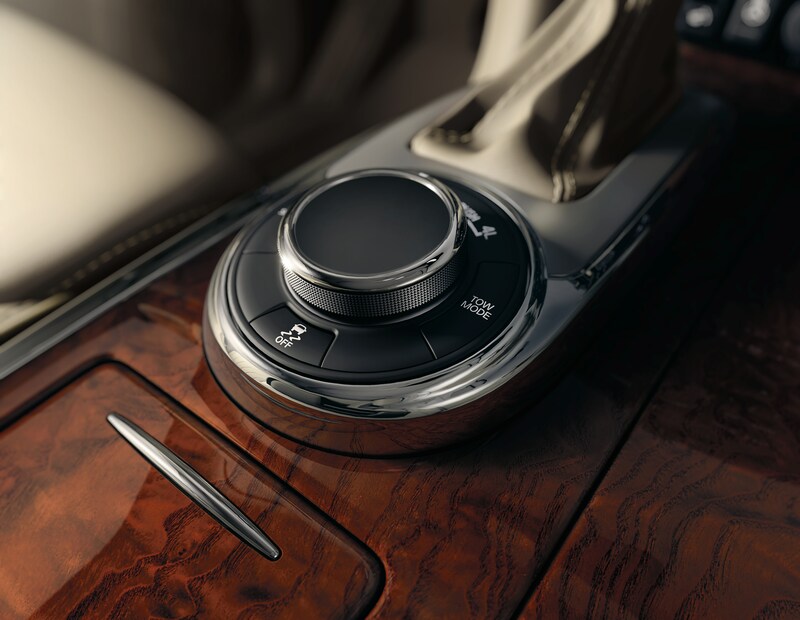 The broad center console armrest is densely padded and slides forward to be useful to shorter people, and the heated steering wheel is pleasing to grip. All that's missing is a wider upper door panel shelf upon which to rest an arm while piling on the miles. In the second row, a bench seat is standard. The test vehicle had the optional captain's chairs, separated by a huge center console storage area. The captain's chairs did not slide forward on tracks to help improve third-row legroom, and they lacked thigh support for taller people. Entering the third-row seat is relatively easy thanks to a power mechanism that tilts the captain's chairs out of the way. Once seated, grown-ups will discover limited comfort, making this seat suitable for pre-teen children. While this might sound unexpected given the Armada's size, this is a common problem in full-size SUVs with the exception of the remarkably comfortable Ford Expedition. 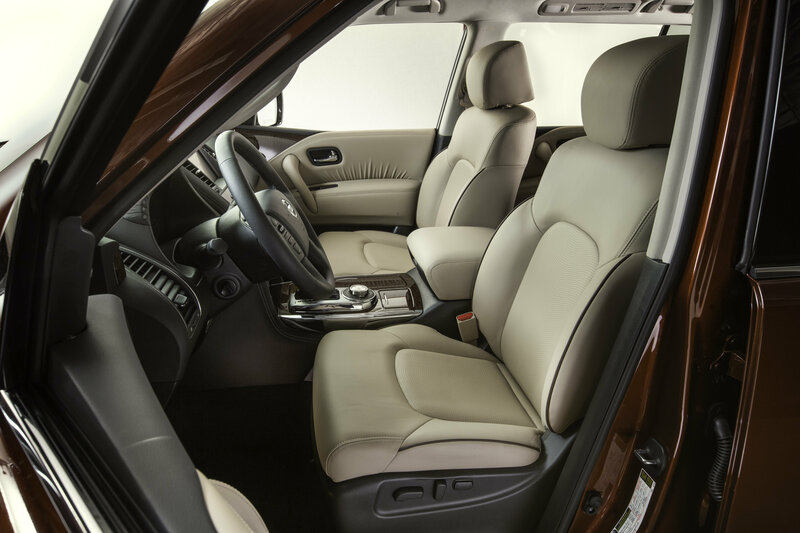 Equipped with a triple-zone climate control system, heated and ventilated front seats, heated steering wheel, heated outboard rear seats, and numerous overhead air vents, the Nissan Armada provides ample regulation of cabin temperature. Plus, the controls are completely disassociated with the infotainment screen, making them easier to find and use. If there is a complaint, it relates to the seat heating and ventilation knobs. Small, ringed in chrome, and illuminated with orange lighting whether you've chosen heating or cooling, even people with perfect 20/20 vision might have trouble using them. During the week of testing in Southern California, temperatures were in the 60s and 70s, which meant weather conditions demanded little from the system. Because the driver's interaction with the Armada's infotainment screen is minimized, the system is easy to understand and a joy to use. Once you set up your six favorite radio stations, you can simply leave the navigation map displayed on the screen as a constant source of reference, including consultation of traffic conditions along your planned route. In reverse gear, or if you manually activate the camera system while parking, the front, rear, and top-view images are shown on the screen. Otherwise, aside from navigation functions, you're unlikely to so much as touch the screen. Nissan could, however, improve the system by adding natural voice-recognition technology. As it stands, the voice-recognition system can cause frustration. The test vehicle also had a dual-screen rear-seat entertainment system. Again, it could not be simpler to use: just pop a DVD into the player and the movie appears on the screen. Viewers enjoy headphones and a remote control. Note, however, that the system cannot play Blu-Ray discs. 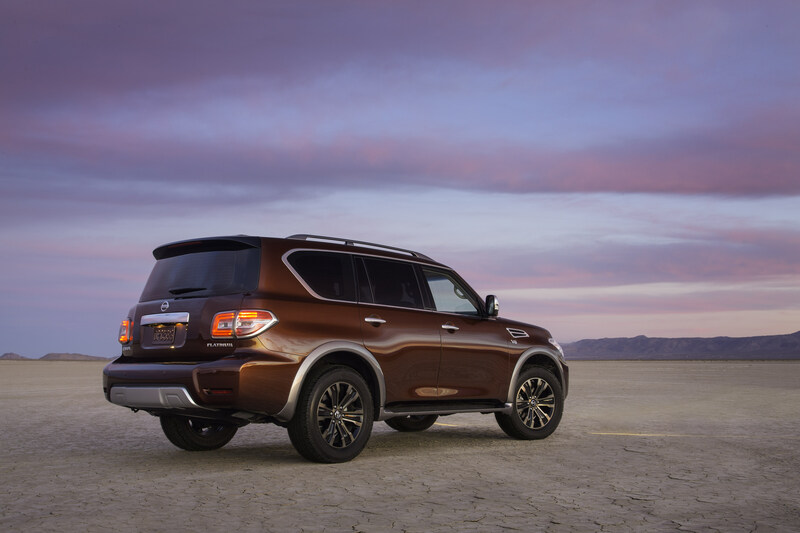 Abundant storage space is a Nissan Armada hallmark. What's lacking are smaller bins and trays to hold items such as the key fob, a smartphone, and other items that people often do not want lost within a big bin, and which render the cupholders unusable for their intended purpose. Cargo space measurements align with the full-size SUV segment leader, the Chevrolet Tahoe. 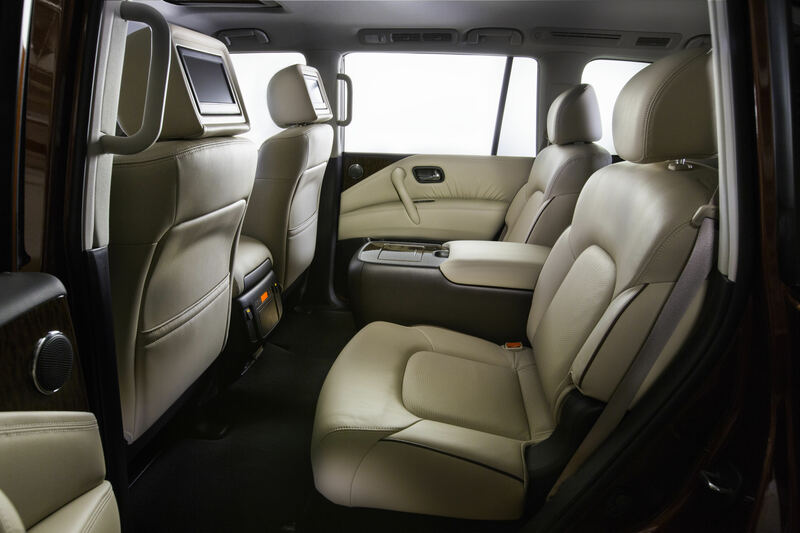 Behind the third-row seat, the Armada offers just 16.5 cu. ft. of space, which means that you can haul extra people or a family load of luggage, but not both at the same time. Fold the third-row seat down (which leaves just 4 seats in the test vehicle) and the Armada accommodates up to 49.9 cu. ft. of cargo. This is a significant amount, but is not dramatically more than a typical midsize crossover can handle. Maximum cargo capacity measures 95.4 cu. ft. Thanks to large windows, oversized mirrors, and the available surround-view camera system, it is easier to see out of the Armada than you might expect. Plus, the driver sits high, seemingly dwarfing nearly all other vehicles on the road, and that helps to improve visibility while a tight turning radius maximizes maneuverability. Curb weight measures nearly 6,000 lbs. Because the Armada weighs more than most other vehicles on the road, occupants are less likely to suffer injury in collisions with lighter cars and SUVs. However, formal crash testing has not been conducted on the new Armada, and it should also be noted that this hefty truck has a tall center of gravity that could negatively impact its ability to resist a rollover accident. Helping to avoid a collision in the first place, an available predictive forward-collision warning and automatic emergency braking system stands ready to act. The system is predictive because it can ?see? two vehicles ahead and react faster to emergency situations than most such systems, Nissan says. Additionally, the 2017 Armada offers an optional lane-departure warning and lane-keeping assist system, a blind-spot warning and lane-change intervention system, and moving-object detection system as part of the 360-degree camera system. A rear cross-traffic alert and rear automatic emergency braking system is also available for the Armada. In practice, all but the lane-departure warning system operate in trustworthy and reliable fashion. The driver can shut the lane-departure warning system off, but it automatically activates each time the SUV is re-started. Most of the time it delivers accurate warnings, but sometimes it does not. A 5.6-liter V-8 engine is standard equipment, producing 390 horsepower and 394 lb.-ft. of torque. A 7-speed automatic transmission delivers power to the Armada's rear wheels unless the SUV is fitted with the optional 4WD system. Maximum towing capacity measures 8,500 lbs., which is competitive with segment sales leaders. At full throttle, the V-8 emits a satisfying bellow and produces commendable acceleration. Under other circumstances, it rumbles with authority and effortlessly moves the heavy Armada, and when driven in a more leisurely fashion the transmission behaves accordingly, seemingly in an effort to conserve fuel. That effort, however, proves somewhat fruitless, as the Armada with 4WD is rated by the EPA to get 13 mpg city, 18 mpg highway, and 15 mpg in combined driving. Full-size SUVs from Ford and General Motors are more efficient, according to the EPA, and are more likely to appeal to buyers seeking maximum fuel economy from a vehicle like this one. 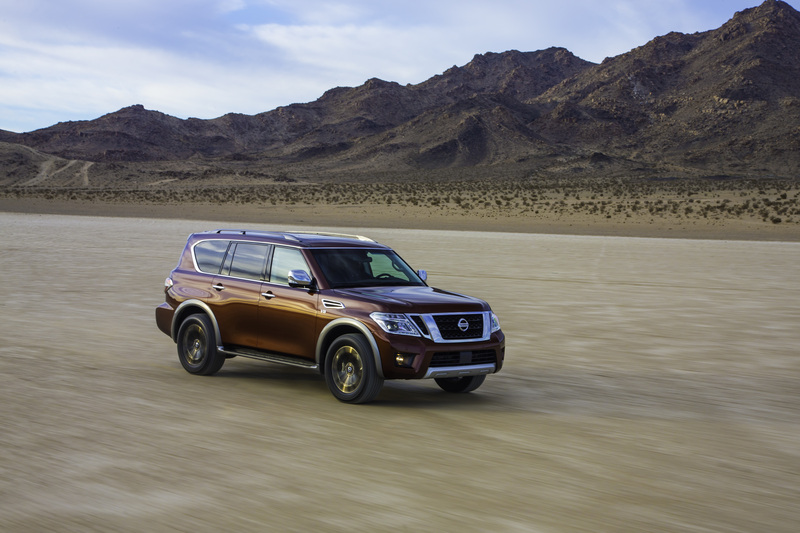 Out in the real world, during a weeklong test involving plenty of highway miles frequently covered with several passengers, the Nissan Armada averaged 15.7 mpg. 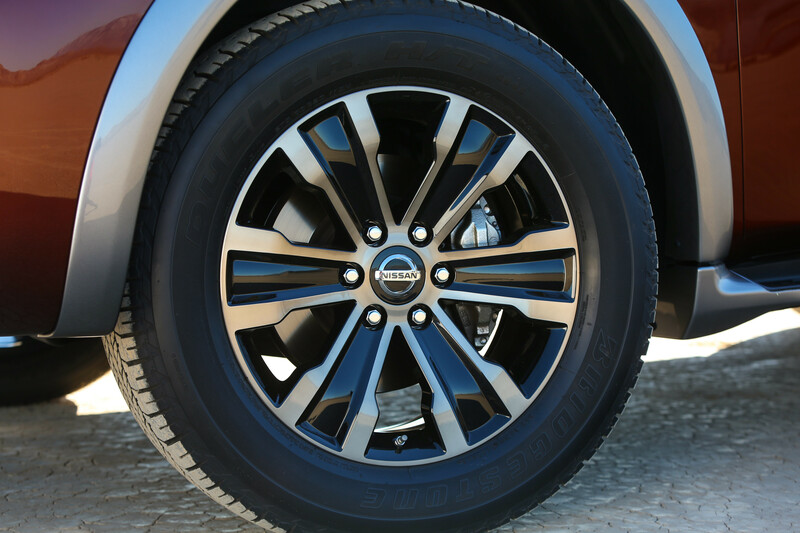 Ruggedness often comes at the expense of ride and handling qualities, and that's true of the Nissan Armada. Despite a 4-wheel independent suspension design, the Armada provides a somewhat jittery ride combined with slow, somewhat heavy steering. In other words, it rides and handles like the truck that it is. Add weight, either in the form of people or cargo, and the ride softens up, unfortunately accompanied by added heaving and weaving. At least the Armada's rear end won't sag thanks to an automatic load-leveling system. Braking capability impresses, aside from a hint of deadness at the top of brake pedal travel. 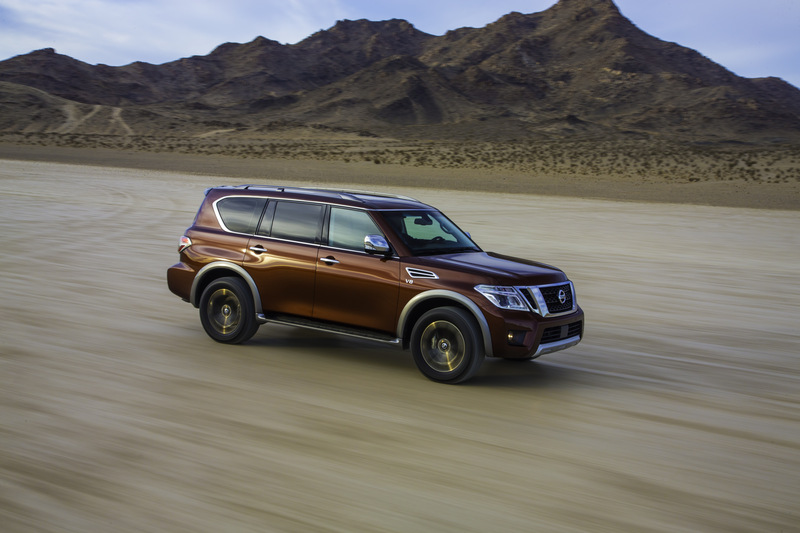 The 4-wheel-disc brakes have no trouble hauling the heavy Armada down from speed. Automatic, 4-Hi, and 4-Lo settings give the Armada's 4WD system added capability, and with 9.2 inches of ground clearance the SUV should prove adept at covering roads less traveled. Unquestionably, the new 2017 Nissan Armada is an improvement over the previous design, which was well over a decade old. It looks better, it has a nicer interior, and its basis on the globally sold Nissan Patrol adds credibility and capability. Plus, it is competitively priced. At the same time, the Patrol upon which the new Armada is based is an aging design, and to some degree that is evident in the Armada, whether related to infotainment omissions, interior packaging compromises, or driving dynamics. Size-wise, it offers no reason for owners of other brands to switch to Nissan, and towing capacity essentially matches the popular Chevrolet Tahoe. 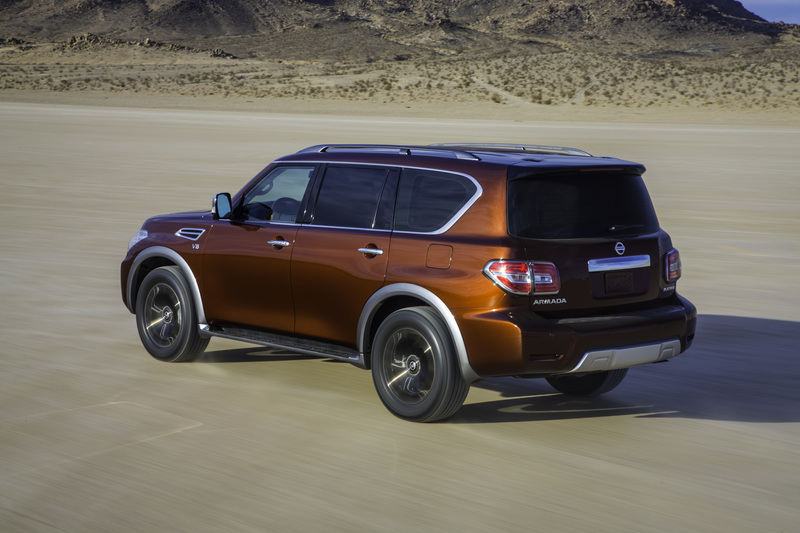 That's OK, though, because Nissan has no plans to conquer the full-size SUV market with the new Armada. Rather, this quick-and-dirty rebadge keeps Nissan in the hunt as an alternative to the status quo, saving design and engineering money within a segment where fortunes rise and fall with the price of gas. Nissan North America supplied the vehicle used for this 2017 Nissan Armada review.